A unique approach to documentation that helps reduce your E&O exposure. Our proprietary and unique Action Menu automatically builds a documentation trail of every client interaction with your agency. Any staff member can pick up where the last left off by reviewing the auto-generated history and detailed notes. Thorough recordkeeping also reduces your agency's E&O exposure and streamlines operations. Ask your staff: is documentation another "to do item" after each phone call or email? Your management system should automatically build the history of your interactions with policyholders. If documentation is a separate task that your staff needs to engage, your agency likely has incomplete documentation. There's never enough time to document, and your staff has other clients that need immediate attention. Annotating, log entries, and documentation in HawkSoft is way ahead of the competition. 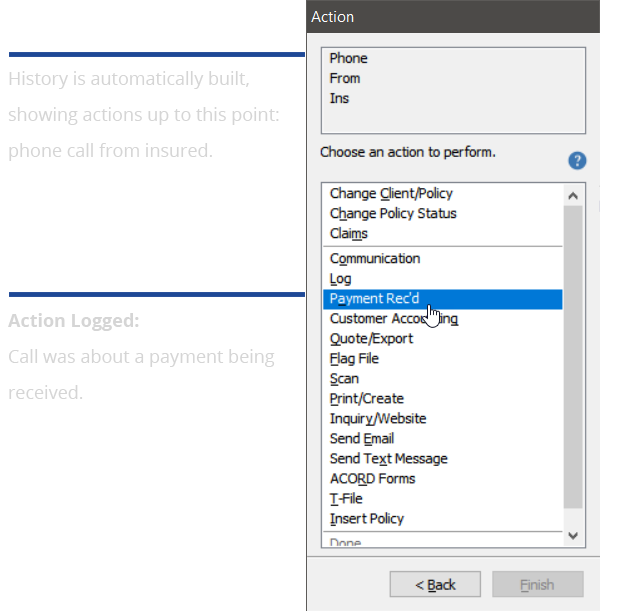 Action Menu automatically logs every action, building a history of your interactions with policyholders. Easily classify incoming methods of contact from Insured. Choose which action you engaged with Insured from dropdown list. 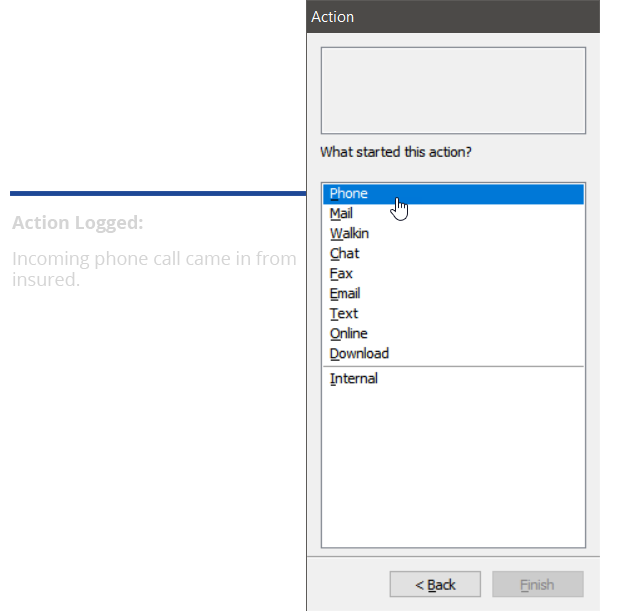 Completed client interactions are summarized on this Action Log page, which serves as a permanent documentation for E&O.